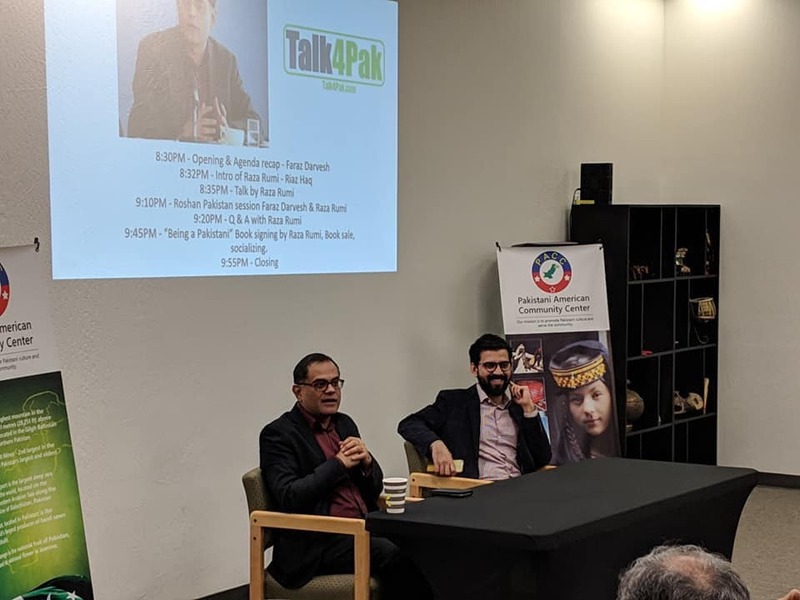 Pakistani author-journalist Raza Ahmad Rumi recently visited San Francisco Bay Area as part of his book tour to promote his latest book "Being Pakistani: Society, Culture and The Arts". Raza had three speaking engagements in the Bay Area: (1) At the World Affairs Council in San Francisco on Wednesday November 14, 2018, (2) Institute of South Asia Studies at University of California at Berkeley on Thursday November 15, 2018, and (3) Pakistani-American Community Center in Silicon Valley, CA on Friday November 16, 2018. The Silicon Valley event with Raza Rumi was organized by Talk4Pak.com, a media platform to connect Pakistani-Americans with Pakistan, at the Pakistani-American Community Center (PACC) in Milpitas, CA. Raza was introduced by Riaz Haq at the PACC. Raza is a alumnus of London School of Economics. He has passed Pakistan Civil Service exam and served in senior positions in Pakistan government. He has also worked as a consultant at the Manila-based Asian Development Bank (ADB). He is currently the editor of Lahore-based Daily Times. He lives in Ithaca, New York and teaches at Cornell University. His books include Delhi by Heart: Impressions of a Pakistani Traveller, The Fractious Path: Pakistan’s Democratic Transition and Identity and Faith and Conflict. His most recent collection of essays Being Pakistani: Society, Culture and The Arts was published in 2018 by Harper Collins. In his presentation at the PACC, Raza Rumi challenged the prevailing one-dimensional narrative of Pakistan that wrongly focuses on extremism and terrorism. He acknowledged that Pakistan does have a serious problem of extremism and terrorism. But these problems also exist elsewhere, including in America where we have seen the rise of white supremacists' violence in recent years. He said part of his motivation in writing Being Pakistani is to highlight Pakistan's other dimensions including, for example, its ancient civilization that is thousands of years old as well its long Sufi traditions of tolerance and inclusiveness. He mentioned the great ancient cities of Mehrgarh in Balochistan, Moenjodaro in Sindh and Harappa in Punjab. Raza emphasized in the areas that now make up Pakistan as a great center of learning with Taxila University, believed to be the world's first university, located close to the twin cities of Rawalpindi-Islamabad. He also mentioned Gandhara Civilization where Buddhism flourished in what is now Khyber PakhtunKhwa (KPK) province of Pakistan. Rumi sees Pakistanis as inheritors of these great civilizations. Rumi talked of the poetry of Bulleh Shah and the work of miniaturist artist Shazia Sikander whose art is displayed at top museums across America and the wildly popular Coke Studio that offers a beautiful fusion of the traditional and the modern poetry and music. Raza said that it was "ironically" during General Musharraf's regime that the deregulation of media, telecom revolution and proliferation of news and entertainment channels allowed Pakistani arts and culture to flourish. Rumi said that there are threats to mass media and free expression but there is also pushback by many who wish to preserve freedom. He said that Pakistan's progress is not linear but it is definitely making progress toward a democratic middle-class nation. There is a growing middle class in Pakistan and the country recently saw peaceful elections and power transfer for the third time in the last decade. The process is far from perfect but the overall trends are positive. On 28 March 2014, Raza was attacked by a group of assailants reportedly members of the Taliban-affiliate Lashkar-e-Jhangvi for his anti-LeJ views. Raza survived the attack, but his driver, Mustafa, was killed. On this incident, the former director of Human Rights Watch wrote: "Miraculously, he emerged unscathed from the hail of gunfire intended for him. Raza is now in a secure location—outside Pakistan. He had no choice but to leave as the authorities felt no embarrassment in letting him know that they could not guarantee his life if he stepped outside his Lahore home. Western Illinois University Associate Professor of Music Education Richard Cangro recently returned from visiting and teaching in Pakistan as part of his 2018 Fulbright Teaching Specialist grant award. This is Cangro's second Fulbright award. He worked with teachers and students at the National Academy of Performing Arts (NAPA) in Karachi and the Beaconhouse National University (BNU) in Lahore for two weeks. "I am very fortunate to have received this award and had the opportunity to visit Pakistan," said Cangro. "One of my goals was to break down stereotypes and misconceptions about the country. I was warmly received, and generously cared for during my visit, and made some great new friends." Most of the students and faculty were proficient in English, so there were no issues in communication. Cangro presented on topics including music education in the US, assessing learning in the arts and his research area of cooperative learning. He also introduced and demonstrated the trumpet and had the opportunity to jam with a sitar artist and students at both colleges. Goals for this trip included sharing information on arts education and cultural exchange; however, a new connection for WIU was at the top of the list. Both NAPA and BNU are very interested in collaborating with WIU to create a music degree program. Meetings with faculty and administrators at both institutions opened the door for future collaborative projects, as well as consultation for creating degree programs not currently available in Pakistan. A contrast in socioeconomic conditions, Pakistan is a young country that is developing and building its identity through education. BNU and NAPA are deeply committed to their students and to building their programs to address 21st century ideals and developing global thinkers in the arts, while preserving their unique culture. Cangro hopes this trip will be the beginning of a long-standing relationship for WIU that encourages study abroad opportunities, student and faculty exchanges and partnership degree plans.